(ideas.) This text first appeared as a letter in the Terminus issue of Art Papers, (January/February 2016), for which I was a guest co-editor. The original, along with a letter by Art Papers Editor and Artistic Director Victoria Camblin, can be found here. Also check out the entire Terminus issue for a cultural view on infrastructure that was supported by the Graham Foundation. I learned how to be a pedestrian during a year abroad in Paris. Mona, a visual arts instructor and guide for our group of students, would walk directly into traffic as if she had as much right to the street as the cars that were swerving around her. She did, of course, but for me, a 22-year-old kid from the suburbs of Atlanta, hers was a new, exhilarating, and even liberated kind of walking. She was partly playing the role of the flâneur, a conscious actor in the theater of the city—a “passionate spectator” according to Charles Baudelaire. 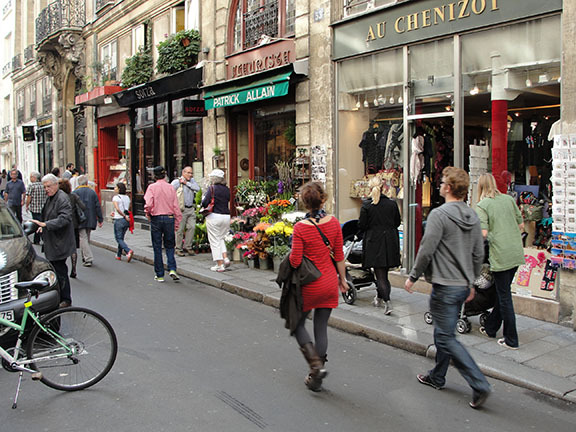 In the mid to late 1800s, the flâneur strolled thoughtfully along the city streets, offering observations and commentary about the built environment, and by doing so, helped define the new lifestyle offered by Napoleon III’s grand boulevards and the epic transformation of Paris. She was partly playing the role of the situationist, who a century later criticized this lifestyle, while decrying the city’s destruction in their own time. To them, the bourgeois environment of the flâneur was only the beginning of a capitalist appropriation of Paris. Through their late 19th century pedestrian-oriented dérive and other spectacles and experiments, the situationists challenged the status quo, pushing back on excessive roadway construction and similar modern city-building efforts, and in the very legitimacy of city-planning practice itself. She was partly, however, just dealing with the reality of the time: like almost any Western city in the mid-1990s, Paris had been significantly altered by its long affair with the automobile. Its physical condition reflected a cultural shift toward driving cars and the space needed to accommodate them. Ancient cities like Paris had required significant modifications to do so, but cities like Atlanta were more malleable. They had only been around for 80 years or so by the time automobiles began to transform American life. Even here, however, the degradation of the pedestrian realm that later necessitated my training from Mona took time. It came through a series of contests for control of the physical space of the street. A notable casualty in Atlanta was Margaret Mitchell, author of Gone with the Wind, who died of injuries from being hit as a pedestrian by a car in 1949. That was the same year the last streetcar was torn from the city’s streets. For the remainder of the century, freed from annoyances like people and trolleys, Atlanta was built almost entirely around cars and the roadways required to drive them. Because cars prevailed in similar contests everywhere, many cities not only forgot how to accommodate pedestrians, but they often made walking a crime. Consider the tragic story of Raquel Nelson, a 30-year-old, carless mother of three who was headed home to her apartment outside Atlanta in the summer of 2011. She was loaded with groceries and her kids were exhausted, so rather than walk half a mile out of her way to the nearest crosswalk and back along a boulevard of sprawl, she jaywalked across five lanes of traffic. When her son ran ahead and was killed by a hit-and-run driver who had had a few beers mixed with painkillers, it was Nelson, not the motorist, who was charged with vehicular homicide. Although she was eventually cleared of charges, Nelson’s story sheds light on the trap of our car-dependency. Vast expanses of our physical environment reflect a legal structure and a set of social values that place the driver’s convenience above a child’s life. Similar evidence of how we value cars more than people can be found just about anywhere, and while there are valid counter-arguments emerging even in Atlanta, the fact remains that most of our resources still go to the cultivation of conditions that punish people who don’t drive—often a proxy for low-income or otherwise disenfranchised communities. Under construction just a few miles from Nelson’s tragedy, for example, is the Northwest Corridor project. At a cost of nearly $1 billion, this 30-mile reversible toll lane follows I-75 northwest of Atlanta. Without companion growth policy to ensure it works as designed, the project can only induce more car traffic. In addition to that, its utility is limited to motor vehicles: no walking, biking, or skating is allowed there; no discussion of its impact on our health or economy; no dialogue about equity or its impact on how people live. Far from fulfilling the dreams we have for our lives, investments like these only emphasize the challenges to rebuilding our cities for people. So it is particularly refreshing to also find momentum behind the Atlanta Beltline and similar projects that are inherently inclusive and that actively engage and even celebrate dialogue about who benefits from their construction, and how. For roughly the same cost as the Northwest Corridor, we could build transit around most of the Atlanta Beltline. That’s not happening yet, but even so, we can see how the concept is already driving much more life-affirming outcomes in our economy, health, and mobility—all despite a more modest investment. Even more importantly, in addition to their utility for non-vehicular forms of transportation today, catalyst infrastructure projects all over the country, including the Atlanta Beltline, are already changing the way car-cultural natives think about the places we live, and the decisions we make about living there. They are highlighting realistic design solutions that are capable of changing transportation habits in cities across America and others worldwide, and ultimately, this will enable much more comprehensive changes in the way we build cities.